The binary options trading industry continues to see exponential growth with most of the participants being newcomers to online financial trading. Naturally, the beginners run from pillar to post in search of tools that give them an edge in analysis and execution. Fortunately, the arrival of social trading networks has opened a new gateway for amateur traders to benefit from the ideas and skills of professionals. Regardless of whether a person is an exceptional trader or a beginner, social trading networks lead to mutual success as discussed below. The traders’ social networks can be defined as the facility which allows traders to make investment decisions solely based on social (information received from other traders) indicators. The concept is quite similar to that of popular social networks such as Facebook and Myspace. First, a trader should create a profile, which should include the details about the market in which he is active and the strategy employed to benefit from the price movements. The trader should then propagate his profile link to get like-minded traders to follow. Once this is done, traders within a network can share their ideas among others in a manner similar to updating the Facebook status. The notable feature about these traders’ social networks is the integration of the real-time trading feeds of the traders belonging to a network. Thus, any trades executed by a trader are concurrently shared with others in the network in an automatic manner. A beginner who is a part of the network can therefore see the overall buy or sell trend. Additionally, technological advancements and transparency allows quick sorting of best and worse performers. This process greatly assists a newcomer to make better trading/investment decisions. It is not a surprise to know that the social networks were initially introduced by brokers. The process was easier because of the fact that a broker had access to real-time data feed and information regarding a client’s trading activity. Initially, the traders’ social network was created by Forex brokers. Considering the catalytic effect of such social networks in the growth of Forex industry, binary brokers (such as EmpireOption) quickly responded with similar traders’ social networking platforms. The binary options social trading networks allow a trader to customize the profile. A trader can select his nickname, load profile photo and introduce himself in a manner in which he would like the world to see him. The profile will also reflect his choice of market and trading style. Apart from English being the primary medium of communication, social trading networks allow exchange of ideas in most of the widely used languages around the world. This is quite important considering the fact that trading skill is no way related to communicating in English or any other language. Almost all necessary details to scrutinize a binary options trader are provided in a social trading platform. This includes success percentage, most profitable asset, best successful streaks, trading frequency, maximum drawdown and details of last three trades. Even the followers and copiers of a trader are shown. Furthermore, those followed or copied by the signal provider himself can be seen as well. The trade history provided in a social trading network platform will also show the real balance of a profiled trader. Additionally, the trades which are currently open can also be seen. Some platforms, even allow the trade history to be downloaded for further analysis. Since early 2000, mirror trading facility has been available in the Forex market. As the binary options industry started registering impressive growth, the brokers (such as IQ Option or RBOptions) began offering the mirror trading facility through the social trading network platform. A mirror trading facility enables a trader to automatically reflect the trades executed by the selected strategy in the account held with a binary options broker. More than a single strategy can be traded concurrently. Such a process allows balancing of risk. Once a trader links his account with a particular strategy, the social trading network platform takes care of the rest by automatically applying the strategy in the client’s trading account. The binary option brokers also offer copy trading facility to a trader. It is much similar to the mirror trading facility except for the fact that instead of specific strategies, a portion of the copy trader’s capital is linked to the account of the copied investor. Thus, in accordance to the proportion of funds allocated, all actions (opening, stop loss, take profit) of copied investor are carried out on copy trader’s account. One important thing to remember is that a copy trader, at his behest, on a suo motu basis, can disconnect the link with a signal (copied investor) provider. This is applicable even when there are copied trades pending auto close. All actions pertaining to copy trading are automatically managed by the social trading network platform. The social trading networks, even allow a follower to be copied. A trader would be smart enough to make an impressive selection of traders to copy, but may not take even a single trading decision on his own. Still, such a copier or follower can be copied by another trader. It is a feature that reflects the technical advancement in social trading platforms. To evaluate a binary options signal provider, some social trading networks allow the signals to be replicated in a demo account. This allows practical scrutiny of the signal provider’s account. 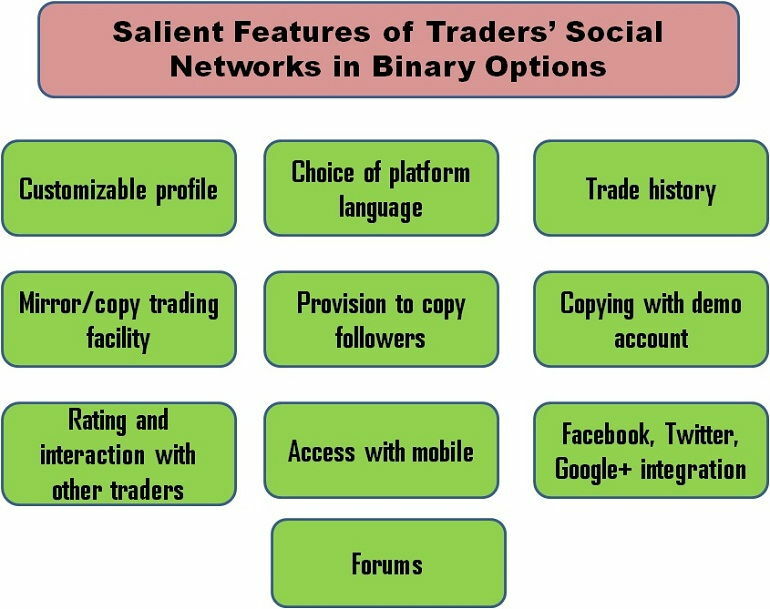 The binary option traders, based on their copying experience, can rate signal providers in social trading networks. This facility allows newcomers to quickly validate a signal provider. Additionally, the platforms also allow binary option traders to interact with fellow traders within the community. Thus, ideas can be exchanged quickly and effectively. This feature enables a trader to access a social trading network through his mobile. For example, ZuluTrade and Copyop social trading networks offer fully functional mobile application (Android & iOS) to their clients. Invariably, all social trading platforms allow a trader to integrate his account with well-known social networks such as Facebook, Twitter and Google+. The facility allows a trader to post his trading performance and attract followers with relative ease. The social trading networks include forums which allow binary option traders to exchange trading strategies and offer suggestions to trading related doubts. Additionally, most forums offer a library of articles from seasoned market experts. Headquarters (location) of the broker and the provider of social trading platform (if both are different). Brokers with whom the social trading network provider has partnered. The minimum investment required to open an account and use the social trading network. Currency in which the account is maintained. Social network management fees, if any. Rules governing a network trader. Empowers traders with much needed knowledge. Creates transparency by allowing free flow of information. Discourages learning the art of technical and fundamental analysis. A beginner will put little effort to learn and create a trading strategy of his own. Too much dependency on other traders for making trading decisions. It should be remembered that, as no two binary brokers are the same, no two trading social networks are similar. A binary option trader should have a clear understanding of the facilities (discussed above) offered by various social trading networks and carefully choose the one that suits his or her needs. Read more articles on Brokers.